Naomi Faik-Simet is a dance researcher with the Institute of Papua New Guinea Studies and conducts research on Papua New Guinea's diverse traditional and contemporary forms of dance. 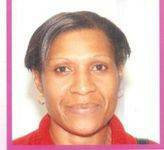 She has published locally and internationally on issues concerning the study and practice of dance in Papua New Guinea. She is currently involved in research, investigating the processes of learning through dance in informal and formal education. Naomi holds a Bachelor of Arts degree in performing arts and a Bachelor of Arts degree (Honours) in literature from the University of Papua New Guinea.